New extended edition of ‘The Illness is the Cure’ – an introduction to Life Medicine and Life Doctoring’ now available from Amazon. Put in other words, what if the most basic medical question of all is not: “how to cure or be cured” of an illness, but rather what the illness is there to cure us of? The principles of Life Medicine and the practices of Life Doctoring are there to help patients ask and find answers to these questions. LIFE MEDICINE is a revolutionary trans-medical approach to health problems – one which recognises that illnesses have life meanings and not just biological causes, that symptoms are not just something to be diagnosed, treated or eliminated, but can be our body’s way of telling us something – and/or a way of fulfilling a need to identify with or talk to someone. LIFE DOCTORING is therapeutic counselling for serious or chronic illness. It is about ‘treating the patient and not the illness’ – by exploring links between your illness and your life – in particular the relation between the emergence of symptoms and significant life changes. Disclaimer: though warning of its grave dangers and questioning its most basic assumptions, this site does not seek to deny the continuing need of most people for conventional forms of ‘biomedicine’. On the contrary, it understands this need as a result of the total lack of funding for both the preventative and healing application of LIFE MEDICINE. This total lack of interest and funding is not surprising given that the vast corporate profits of the pharmaceutical and hi-tech health technology corporations (amounting to three times those of all the Fortune 500 companies put together) depend on maintaing the status quo in both medical thinking and practice. Even truly effective and non-damaging biomedical ‘cures’, let alone entirely new forms of therapy not requiring drugs or surgery, would constitute the death-knell of the corporate health industry – not least Big Pharma and The Cancer Industry. Have you ever felt that just by making an appointment to see your doctor you are just bothering them and interfering with their busy schedule? Have you ever felt your doctor’s sole purpose in listening to you is to come to the quickest possible way of seeing you out – whether by handing out a prescription or arranging a test? Have you ever felt frustrated by the lack of truly patient listening time that doctors are able or willing to give you and other ‘patients’? Have you ever felt infantilised or treated like a child by medical professionals, felt that your questions were not fully heard or answered, or been confused by conflicting opinions and beliefs expressed by different doctors and consultants? 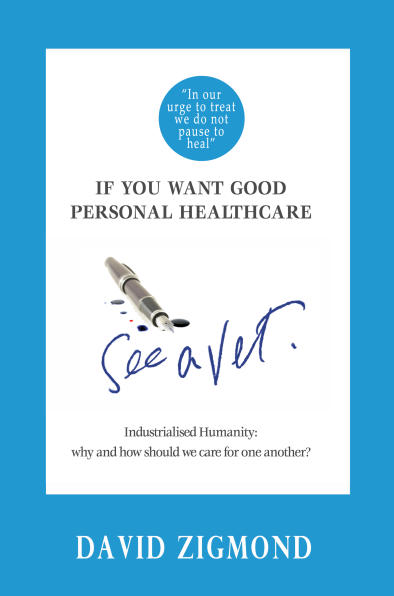 Have you ever felt frustrated about being given one medical test after another, being passed from one anonymous consultant to another, or being given one form of treatment or surgery after another – all without ever having a say in what’s going on – and that your personal feelings and experience of illness and its treatment are of no interest to medical ‘experts’? Have you ever wondered why health insurance costs are so high, tests and prescriptions so expensive, or why free national health services such as those in the U.K. are in constant financial ‘crisis’ – namely because of the billions spent on unnecessary or even damaging tests, treatments and operations, all of which are a massive cash cow and create massive profits for private pharmaceutical corporations and providers of hi-tech medical instrumentation? To allow you to share your personal experience of illness and of medical services and treatments with a medically informed counsellor independent of the medical profession. To provide individuals with serious or chronic illnesses or symptoms with quality listening time of a sort that doctors and consultants have no time for. Healing begins with being fully heard as a human being and not just a possible ‘case’ of some disease. To offer you knowledgeable and informed advice on medical diagnoses, and help you to make informed choices about medical treatments, including their dangers and side-effects. To discover what may be significant links between your illness and significant events and experiences in your life. To explore and both the medical and biographical history of your illness in detail, as well as its impact on your current life. To put you more in touch with your body and what it may be telling you. For example to help you ask what your symptoms may be a way of saying – to yourself or to others. To help you sense what questions your illness may itself be there to make you ask about your life. To offer you a new perspective on the nature of illness, one that recognises that illnesses have meanings and not just external or internal causes. To show you that insight into the life meaning of your illness can be more healing than medical treatments. To make you aware of possible relational dimensions of your illness – its connection to your personal, family and social relationships, past and present. To help to relate to your illness itself in new ways, free of preconceived medical beliefs and the fears they can arouse. To introduce you to new forms of healing which make use of new forms of meditation rather than drugs and medication. To help you be more aware of your own body, to trust its authority above that of any body of medical beliefs – and to recognise that you intuitively know more about your body than any doctor. To offer you important knowledge, advice and support in preparing in advance for consultations with doctors, consultants, surgeons or other health professionals. Illnesses have life meanings not biological causes! People may die through illnesses and not because of them! It is not illnesses that are the problem in our lives – but the life problems that express themselves in and as illnesses. Life Medicine is ‘holistic’ medicine in the truest sense, exploring the relation between the life of our bodies and our lives and life world as a whole. Life Medicine challenges the whole separation between what is called physical’, ‘organic’ or ‘somatic’ illness on the one hand and ‘psychological’ or ‘mental’ illness on the other. It does not merely focus on a specific category of so-called ‘psychosomatic’ or ‘stress-related’ illnesses. Life Medicine recognises that every bodily state is at the same time a ‘psychological’ state or state of consciousness. and that every state of consciousness is a felt mood or state of our body as whole – nothing restricted to our brain alone. Life Medicine recognises that ‘illness’ begins with a felt sense of ‘dis-ease’ with feeling ‘ill-at-ease’ in some way with ourselves, other people or our lives. Life Medicine affirms the healing value of illness, recognising that the sense of ‘not feeling ourselves’ that marks the onset of symptoms can be the beginning of a journey that leads to ‘feeling another self’. Life Medicine recognises that for many if not most people, real or apparent somatic symptoms are the only way they can give expression to and gain recognition of the ways they are ill-at-ease with their life and its stresses. Life Medicine affirms the healing value of illness, as journey that takes us from a felt sense of dis-ease – of ‘not feeling ourselves’- to ‘feeling another self’ – one more at ease with our life. Life Medicine understands illness not just as something to ‘bear’ but as a form of pregnancy with its own gestation period and labour pains – yet helping us to feel, give birth to and embody a new inner bearing toward our life and relationships. Life Medicine can help prevent a patient from getting entrapped in the medical or psychiatric system, and being reduced to a mere ‘case’ of some clinically diagnosed disease. Life Medicine protects the patient from being persuaded into accepting potentially dangerous, counter-productive or even life-threatening forms of orthodox biomedical testing and treatment. If seeking a consultation with a therapist, it would be useful if your initial mail would include your phone number, date of birth and a brief personal and medical history of your life and illness.